From overwater bungalows at Secrets Silversands to wellness offerings at Hyatt Zilara Cancun, there’s a dizzying array of choices when it comes to all-inclusive resorts in Cancun Riviera Maya, Mexico. 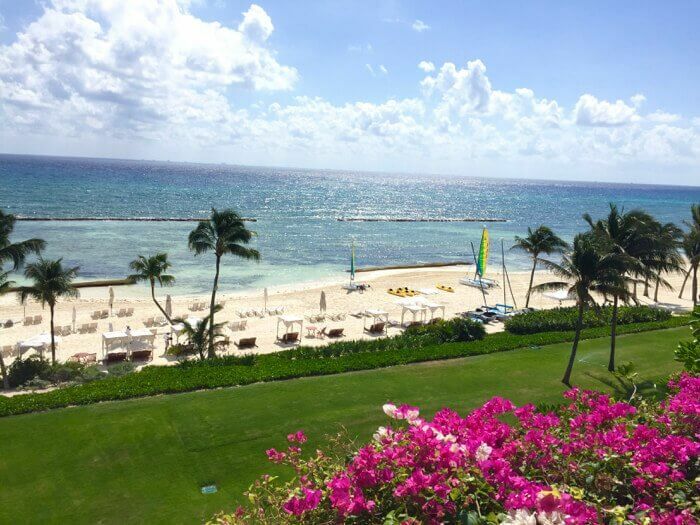 But when it comes to choosing the absolute best of the all-inclusive resorts near Cancun, the ones we’d love to return to (and recommend to friends and family), certain resorts rise to the top of our list. In addition to must-haves like all-inclusive luxury accommodation, meals, drinks, activities and room service as well as cleanliness, safety and service, these hotels have unique ingredients that make them extra special. Here are our top picks for the very best all-inclusive resorts in Cancun and Riviera Maya for 2019.
Insider Tip: Planning a visit to Mexico’s Caribbean coast? Check our update and forecast on seaweed conditions in Cancun and Riviera Maya in 2019. Why Go: Set on the widest stretch of sand in the hotel zone, this adult-only, all-inclusive luxury resort recently unveiled a redesign of its wellness programs, spa facility and culinary offerings which vaults it to the top of my list of the best all-inclusive resorts for 2019. 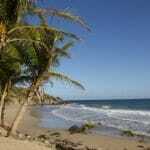 Being set on a wide stretch of beach means it experiences much less of an impact from seaweed and beach erosion. 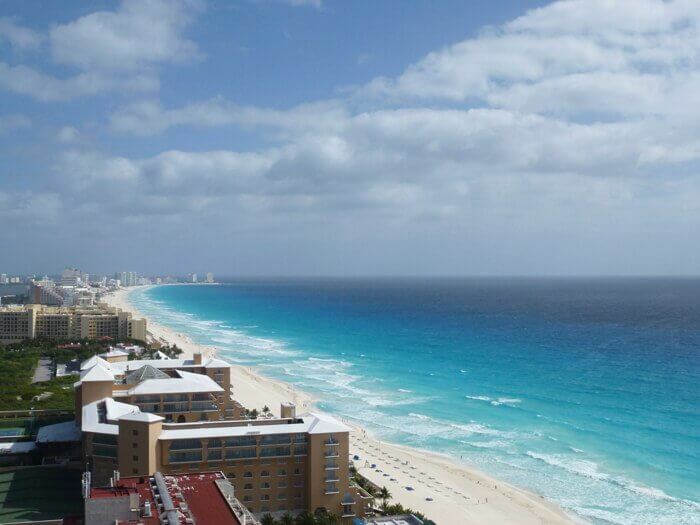 Another appealing feature of the Hyatt Zilara Cancun is that all of the suites feature fantastic ocean views. Although this property is older than some of the other resorts in Cancun, it scored a prime location and features much larger suites than many of the newer builds. For example, the balconies are large enough to actually enjoy. Many even have hammocks so you can really soak up the tropical atmosphere. I’m also a big fan of the Hyatt Zilara’s 24-hour in-suite dining with a “magic box” for discreet room service delivery ( who wants to get dressed for room service?). Healthy dining options are available throughout the resort’s 11 restaurants, bars, lounges and cafes which makes this property especially appealing to vegan, vegetarian and gluten-free diners. This luxury property also appeals to all ages of adults – from 30-somethings to baby boomers. With activities such as foam pool parties, hands-on cooking classes in a real kitchen theatre (no demos here) and morning ashtanga and vinyassa yoga on the beach, there is something for everyone to participate in. The fact that so many of the activities are included makes the Hyatt Zilara one of the best value all-inclusive resorts in Cancun. Extra Special: The wellness offerings are exceptional at the Hyatt Zilara Cancun and contribute to a creating a vacation experience where you actually come back feeling healthier than when you arrived. The hydrotherapy circuit, available complimentary to guests, with its hot and cold zones of plunge pools, whirlpool, sauna, steam room and more, is the heart of the Hyatt Zilara Cancun’s newly renovated three-story Zen Spa. Guests can soak up the therapeutic benefits of mineral-rich waters, take a spa treatment and then relax on lounge chairs within a beautiful, brand new space. Working out is also a pleasure in the resort’s stunning Sky Gym featuring modern fitness equipment such as treadmills, weights and strength training machines. The full-length,outdoor infinity lap pool offers fantastic views. Why Go: No need to endure a long flight to Bora Bora! 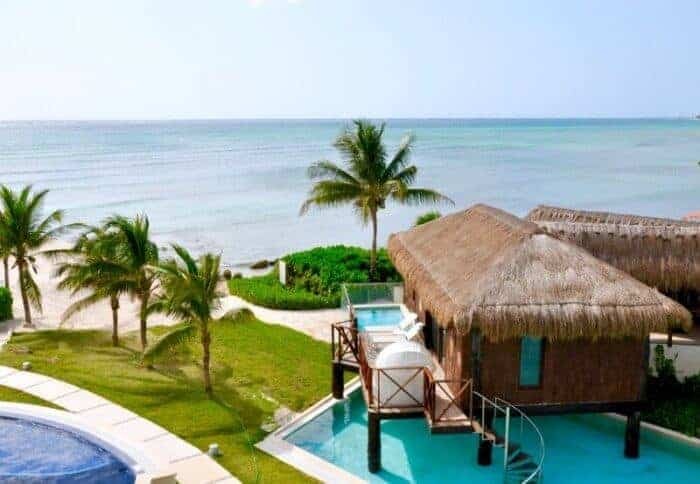 Adults-only Secrets Silversands Riviera Cancun is home to a collection of Tahiti-style Overwater Bungalows. And it’s just 20-minutes from Cancun’s action, yet feels a world away in atmosphere. Much like Secrets Huatulco, the architecture at Secrets Silversands is dramatic and contemporary, featuring eight swimming pools, eight restaurants and a full-service spa. Extra Special: Splurge on the Preferred Club Ocean View Overwater Bungalow with Plunge Pool and you’ll enjoy a thatched roof cabana and oceanfront deck set on stilts above turquoise waters. It’s an unforgettable experience to wake to the sound of the waves, enjoy butler service on a private beach, 24-hour room service and a “Secret Box” where your breakfast in bed or midnight snack are slipped silently inside so you’re not disturbed. Secrets Silversands is the only Secrets Resort I know of that has overwater bungalows. Wondering about the best Secrets resort? Trying to decide between Secrets Silversands and Secrets The Vine? The main difference is that Secrets Silversands is much more secluded than Secrets The Vine – the beach is smaller but almost completely private ( compared to being in the heart of Cancun’s fun zone) and its buildings are low rise. Entertainment options are also more low-key. Why Go: This lush and luxurious resort makes our list of the Best All-inclusive Resorts in Cancun and Riviera Maya for 2018 and 2019 mostly because of its superior cuisine but its family-friendly amenities make it the best resort for families near Playa del Carmen. Its setting will make you feel as though you’ve been transported to a jungle retreat. Set amid mangroves, towering Yucatan rainforest and meandering streams, the Grand Velas Riviera Maya Playa del Carmen also features a huge infinity swimming pool and spa zone. 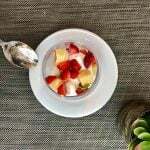 Extra Special: Fine cuisine is a highlight of a stay here. Grand Velas Riviera Maya has launched a new DIY ceviche bar at the resort’s oceanfront Azul restaurant. Assisted by a resort chef, guests can craft their own ceviche, selecting from a variety of tuna, salmon, scallops, squid and shrimp and options such as tomato, cucumber, avocado, corn, chile peppers, chopped garlic, onion and more. Top it all off with lime juice, Maggi sauce, Worcestershire, Salsa Huichol, Tabasco and olive oil. Or, ready-made ceviche is also available if you want to leave it to the pros. Why Go: This sophisticated yet playful adults-only high-rise hotel towers over the beach in the heart of the Cancun’s lively Hotel Zone. It’s unique in so many ways we just had to add it to our list of Best All-Inclusive Resorts in Cancun and Riviera Maya for 2019. 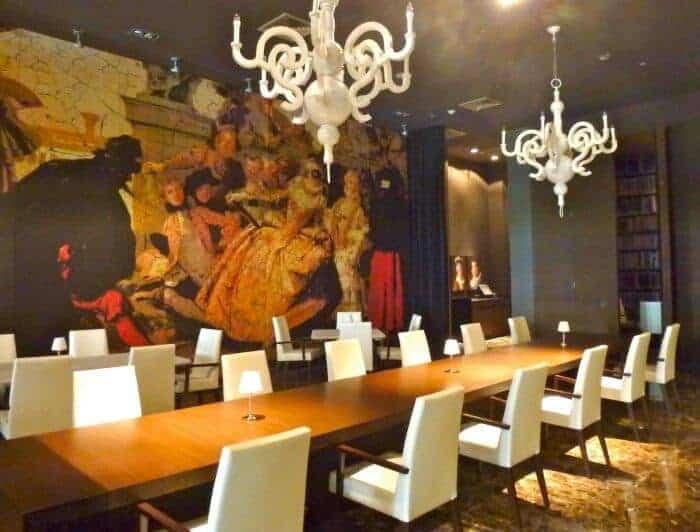 Secrets The Vine Cancun was designed by The Rockwell Group (the same award-winning architectural group that designed Nobu Hotel in Las Vegas) so it offers drama at every turn. One of the features we love is that the glass and white metal 18–story facade is positioned at an east–west angle. This means guests enjoy fantastic ocean views as well as the rare opportunity to watch both sunrise and sunset. 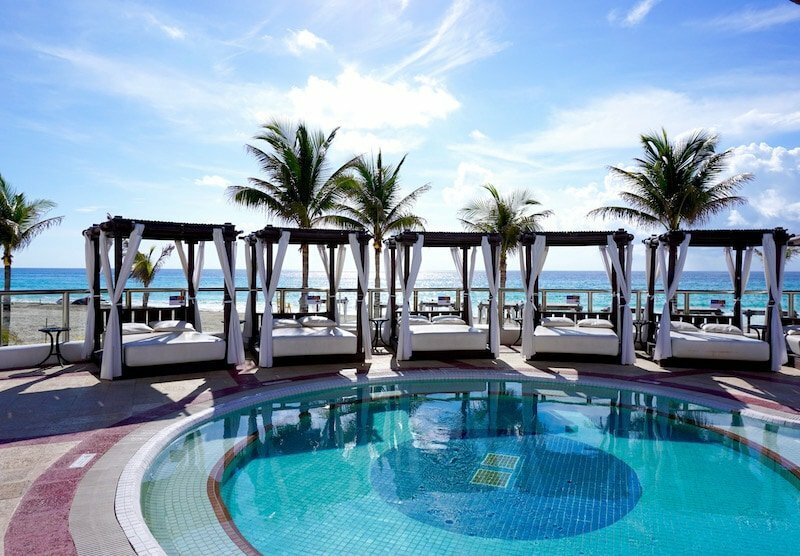 Read our full review of Secrets The Vine Cancun to see interior photos and pool shots. Extra Special: Being in the heart of the Cancun hotel zone has lots of advantages. You’re steps away from the fantastic Museo Maya de Cancun, the most important new museum by Mexico’s National Institute of Anthropology and History since the construction of the Museo del Templo Mayor in 1987. You’ll also enjoy easy access to attractions such as Xoximilco Cancun ( a floating fiesta featuring gondolas), Xcaret, Xel-ha snorkelling park and all the underground cenotes you have the stamina to explore. You can easily hop over to Isla Mujeres, an offshore island ringed with white sand. Why Go: This glamorous all-inclusive is set amid shimmering water gardens, sculptures and art work within walking distance ( or taxi ride) of Playa del Carmen, which means it’s easy to get out and go exploring Quinta Avenida, Playa del Carmen’s pedestrian zone. Opt for the Royal Service upgrade and you’ll enjoy many worthwhile extras. Extra Special: Bold, playful, experimental–an evening at Passion by Martin Berasategui is not your ordinary dining experience. Overseen by the esteemed Spanish chef ( who has garnered 8 Michelin stars), it’s an unforgettable foodie experience which makes Paradisus La Perla Playa del Carmen one of our picks for the best all-inclusive resorts in Cancun-Riviera Maya in 2018 and again in 2019. Opt for the tasting menu, a sensory journey through the tastes, textures and ingredients of the best of molecular cuisine. You won’t soon forget imaginative dishes such as smoked tuna tartare and tempura truffled egg yolk with seaweed cream. Why Go: Imagine owning your own Caribbean luxury villa and you get a sense of what staying at Zoetry Paraiso de la Bonita is like. Each of these low-rise villa suites is uniquely decorated with original artwork, Indonesian furniture and rich tapestries. They come decked out with expansive terraces, many with plunge pools. The entire Zoetry resort is located within the protected Puerto Morelos Marine Park and included in the all-inclusive rate are life enrichment experiences as well as an extensive wellness program. The cuisine is so healthy and delicious, you will come away from your vacation feeling refreshed and rejuvenated. Extra Special: One of the reasons Zoetry Paraiso de la Bonita is one of our top choices for the best all-inclusive resorts on the Riviera Maya is the unlimited access to the resort’s Thalasso pool featuring natural seawater. The first Thalassotherapy spa in Mexico, the facility offers an indoor Jacuzzi circuit, steam room and seawater pool overlooking the Caribbean. The spa menu includes specialized hydrotherapy treatments, massage, mani–pedis, and anti–aging treatments with esteemed lines such as Valmont and Natura Bissé as well as mud baths, seaweed and natural treatments. Planning a long-stay vacation? Read our Insider’s Guide to the Best Vacation Rentals in Playa del Carmen or check out these Cancun timeshare listings for apartment hotel condos which come equipped with kitchens making them a good option for long term accommodation. Beach Quality: Note that due to weather conditions, the size of the beaches and quality of the water along the Mexican coast stretching from Cancun to Tulum can vary from day to day. You may see large quantities of sargassum grass (seaweed) which isn’t the most attractive sight if you’re expecting to see clear blue waters. Storm surges can also wash away or add sand in sections of the beach which changes the width of the beach itself. Most luxury resorts have programs in place to rake away the sargasso grass and haul it away (with the exception of the protected zones of Puerto Morelos) and create breakwaters with sandbags. Check our beach update on seaweed conditions in Cancun and Riviera Maya from our onsite inspection in August and November 2018. Is Cancun Safe? 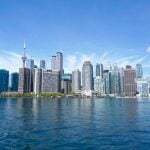 In August 2017, Mexican authorities seized gallons of illegal alcohol after discovering an illicit manufacturer was supplying some tourist attractions, hotels and bars in Cancun and Playa del Carmen with tainted alcohol. Officials shut down operations at two bars, including one at the resort Iberostar Paraiso Maya. Alcohol seized from Kukulkan, the bar at Iberostar Paraiso Maya, was expired and unlabeled and kept in unsanitary conditions. None of the resorts on our list were identified for any infractions. Thx for this great list, Michele. 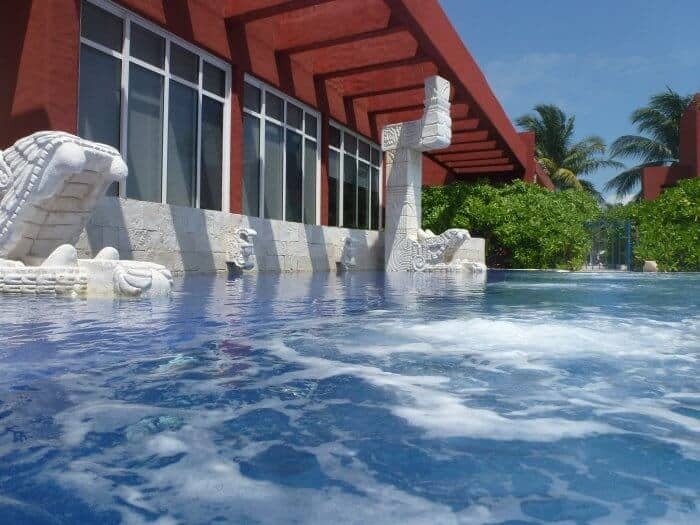 I think I’d pick Zoetry in Puerto Morelos. We visited Puerto Morelos earlier this year and loved the quiet vibe of the place. I would love to go back! I’ve never been to Cancun, but if I go I think I’ll opt for that last resort so I can experience the Thalasso spa and that natural seawater pool! I’ve never done an all inclusive resort….I really need to try it sometime. These look amazing! 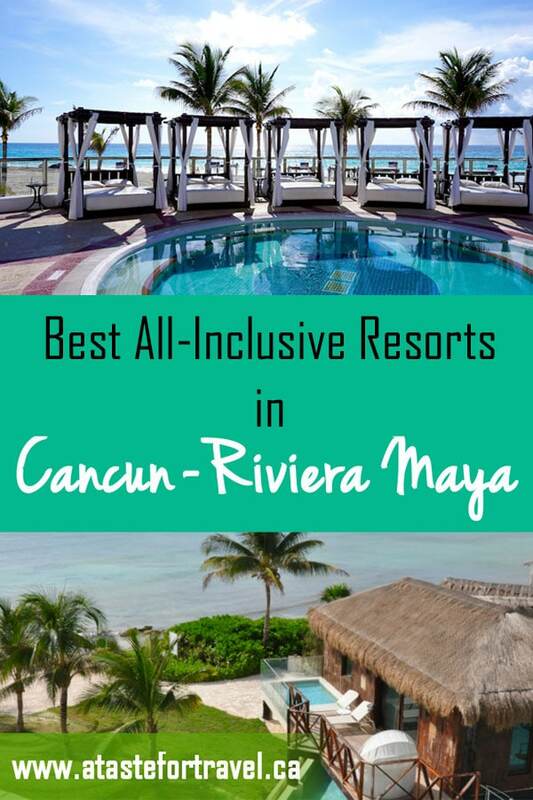 I really enjoyed reading about the all inclusive resorts in Cancun and Riviera Maya. I like how you organized your article as well; why go and extra special. Certainly makes me want to go!! My sister was in Playa del Carmen 2 or so years ago with her husband, and has been telling me we should do a sisters trip there in the future. That’s how much she enjoyed it. I’ll keep this list in mind when we do get around the planning! What a great breakdown of amazing places! Mexico is such a great winter destination, it’s key to pair it with the perfect place to stay! Wow Michele, this s all gorgeous and luxurious. It looks perfect to bring my family for a relaxing vacation.